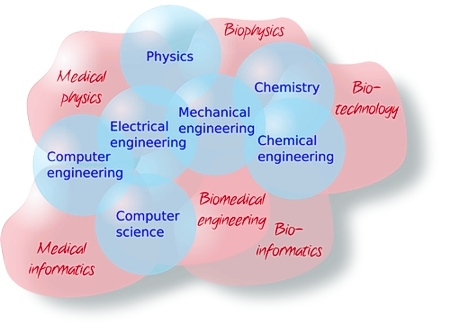 Though we do not have an undergraduate program, if you plan on studying biomedical engineering at the graduate level you are encouraged to take the undergraduate Minor Program in Biomedical Engineering or some courses in physiology and life sciences (for engineers, physicists), and quantitative courses (for life science students). Note: the Minor Program is managed by advisers in the program and not by us. Please direct all questions to a program adviser; see Details of the Minor Program below for contact information. Any one of the courses listed below is appropriate for fulfilling the Master's program prerequisites for ‘a university-level course in general physiology, cell biology, or molecular biology’ for non-life science students wishing to study biomedical engineering. Minor Advisers: Prof. R. Leask (Wong Building, Room 4120), Prof. R. Mongrain (Macdonald Engineering Building, Room 369), or Prof. G. Mitsis (Macdonald Engineering Building, Room 384). Note: Open to all students in the Faculty of Engineering. The Biomedical Engineering Minor allows access to courses in basic life sciences and is intended to expose students to the interdisciplinary tools used in biomedicine. To complete this Minor, students must obtain a grade of C or better in all approved courses and satisfy the requirements of both the Major program and the Minor. Students considering this Minor should contact the Minor Advisers listed above. Students must select 6 credits from courses outside their department and at least one BMDE course. These BMDE courses are best taken near the end of the program, when prerequisites have been satisfied. Anatomy & Cell Biology: An integrated treatment of the properties of biological membranes and of intracellular signaling, including the major role that membranes play in transducing and integrating cellular regulatory signals. Biological membrane organization and dynamics; membrane transport; membrane receptors and their associated effectors; mechanisms of regulation of cell growth, morphology, differentiation and death. Biochemistry: Gene expression from the start of transcription to the synthesis of proteins, their modifications and degradation. Topics covered: purine and pyrimidine metabolism; transcription and its regulation; mRNA processing; translation; targeting of proteins to specific cellular sites; protein glycosylation; protein phosphorylation; protein turn-over; programmed cell death (apoptosis). Biomedical Engineering: Introduction to major techniques of molecular biology for physical scientists. Biomedical Engineering: Quantitative models for key intra- and inter-cellular processes. Key mathematical concepts: stochastic differential equations, Markov models, Gibbs free energy, and Fick's Law. Biological systems: neurons, networks of bacteria, and genetic regulatory systems. Emphasis on the design of quantitative experiments and data analysis. Computer Science (Sci): Advanced algorithm design and analysis. Linear programming, complexity and NP-completeness, advanced algorithmic techniques. Mining & Materials Engineering: Stress-strain behaviour. Elasticity and plasticity of metals, ceramics and polymers. Dislocations theory. Single crystal and polycrystalline slip. Mechanical twinning. Strengthening mechanisms. Process-property and microstructure-property relationships. Notch toughness and fracture mechanics. Failure, fracture and damage accumulation. Fatigue. Creep and creep rupture. Fractography. Design considerations in materials selection. * Students choose either CHEE 563 or MECH 563. Physics: General nuclear properties, nucleon-nucleon interaction and scattering theory, radioactivity, nuclear models, nuclear reactions. Physics: Analytic and computer simulation techniques are used to examine the role of nonlinearities and time delays in determining the dynamic behaviour of physiological control systems and their relation to normal and pathophysiological states. Examples drawn from the control of respiration, cellular proliferation and differentiation, biochemical feedback networks, thermoregulatory mechanisms, and neural feedback. Up to 6 credits in the B.Eng., or B.Sc.(Arch.) program can also be credited to the Minor, with the permission of the Departmental Adviser and approval of the Minor Adviser. In particular, courses at the 200 level or higher that are prerequisites for certain specialization courses would be eligible, with permission of the Minor Adviser. By careful selection of complementary courses, the Minor can be satisfied with 9 additional credits in the student's major program or a maximum of 12 credits of overlap with the major program.